The University of Southampton’s striking new Mountbatten Building, which has risen from the ashes of the fire that destroyed its predecessor in October 2005, has won a top architecture award. It has received a prestigious Royal Institute of British Architects (RIBA) Award, which are given for buildings that have high architectural standards and make a substantial contribution to the local environment. The building has been designed to consume 65% less energy than a comparable scheme of this type. The £55m Mountbatten project will now be short-listed for the RIBA Stirling Prize honouring the best new buildings in the country. 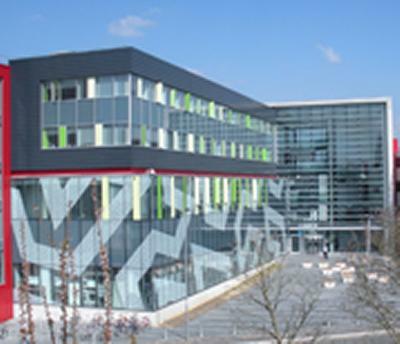 The Mountbatten Building houses the University’s School of Electronics and Computer Science (ECS) and its Optoelectronics Research Centre (ORC) and is a key element in maintaining the University’s global reputation for world-leading research in nanotechnology and photonics. The building is also one of Europe’s leading multidisciplinary and state-of-the-art clean room complexes. Both inside and outside, with its laboratories, flexible teaching and learning space, and impressively spacious atrium, the Mountbatten Building makes a statement. The design is bold and modern, the building’s glass curtain walls – graced by a mathematical fractal pattern – enable those outside to view the research taking place in the clean rooms. Another of University’s landmark buildings, the £18 million EEE Building that marks the entrance to the University's Highfield campus, has been short-listed for a Royal Institution of Chartered Surveyors (RICS) award. The ceremony is taking place tonight (21 May). The University is delighted that high quality of its built environment is being recognised through such prestigious awards. The Royal Institute of British Architects is the UK body for architecture and the architectural profession. Their annual award schemes recognise outstanding architecture and culminate in the RIBA Stirling Prize. The RIBA Stirling Prize in association with The Architects' Journal is awarded to the architects of the building that has made the greatest contribution to British architecture in the past year. The new Mountbatten Building shares the name of its predecessor on the same site. The original building opened in 1992, bearing the name of Earl Mountbatten of Burma, a Past-President of the Institution of Electrical Engineering, whose papers had recently been given on loan to the University’s Hartley Library. The building’s striking appearance provides a highly visual clue to its purpose. The clean rooms and laboratories which occupy the two lower floors are characterized by the Peano-Gosper fractal etched on the glass panels which enclose the building. The fractal was used in research undertaken by Professor Darren Bagnall and Dr Adrian Potts of ECS and Professor Nikolay Zheludev of the Optoelectronics Research Centre.